Beautiful aren’t they? I stumped on this video ‘Rose di pasta sfoglia’ on YouTube while I was looking for six-braid challah braiding instructions, and thought, I’M MAKING IT! The instructions are in Italian (I think) so I was just guessing the amount of ingredients based on the video. 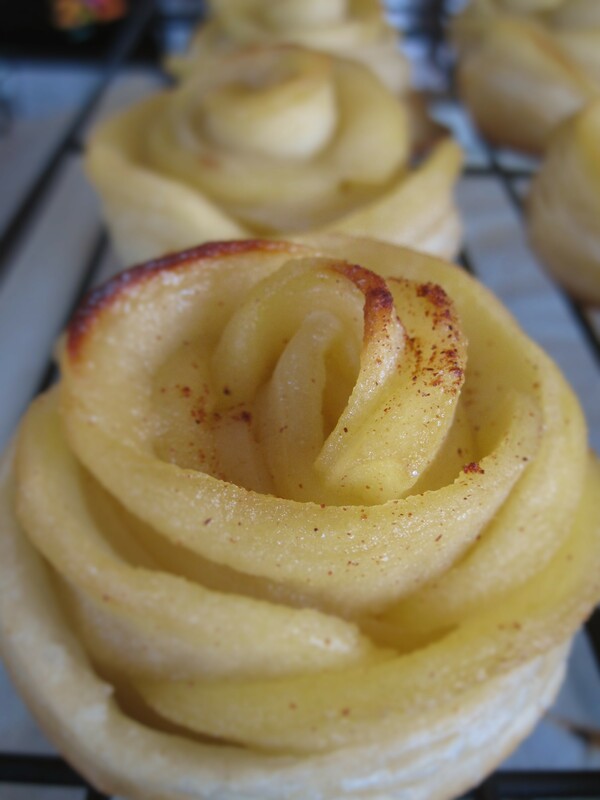 Despite its fancy look, these edible roses are quite easy to make using store bought puff pastry dough, and I guarantee the receiver(s) of these roses will go WOW!! Well, being the first trial, and just like the beautiful fragrant roses in the garden, they have challenges. My problem this time was that the pastry dough didn’t cook through towards the center. The bottom was already quite brown, the outer layer pastry puffed up, and ‘petals’ was getting burnt, but the inner pastry layers were still not done!! I ran out of time, and also couldn’t bake it any longer without risking my beautiful rose petals. Maybe I set oven temperature too high (400°F)? 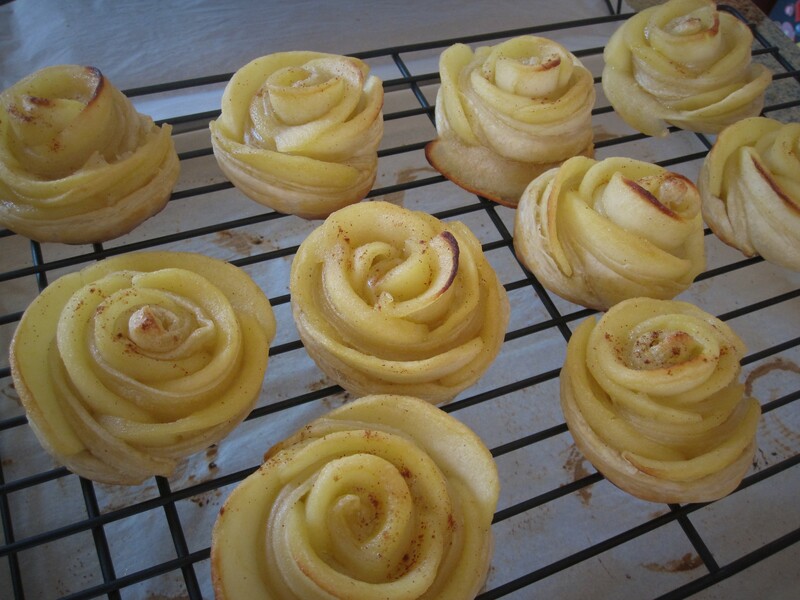 I made these apple roses for Alexander’s birthday, and we had some leftovers the next day. I reheated the leftovers in preheated 375°F oven for 10-15 minutes to see if the pastry part improves~ well, it puffs up some more, but still not all layers puffed up… Luckily this is an easy and quick dessert so it’s not that hard to make a different batch for next trial. Peel and core apples. Slice thin, about 1/4 inch thickness. Sprinkle lemon juice, toss to coat well. Melt butter in a pan over medium high heat. Add sugar, salt and cinnamon. Mix to blend well. 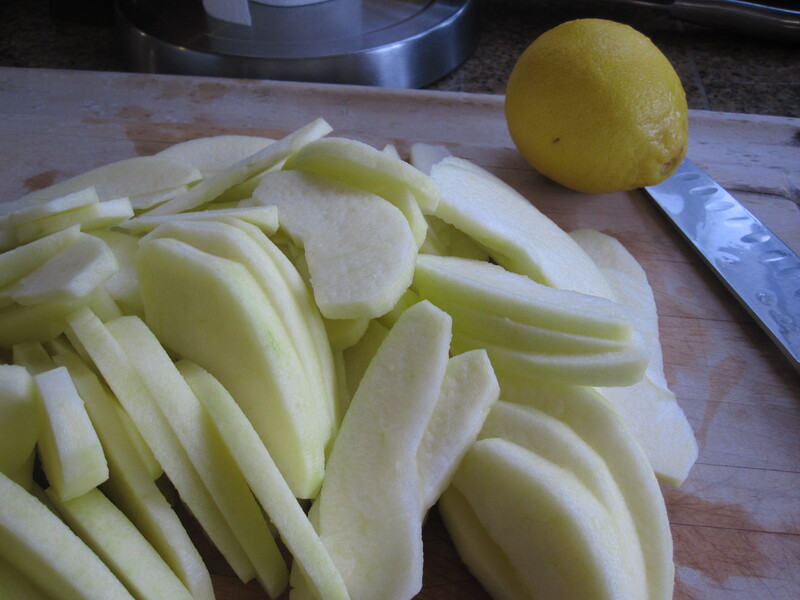 When sugar dissolves, add in apple slices (drain lemon juice). 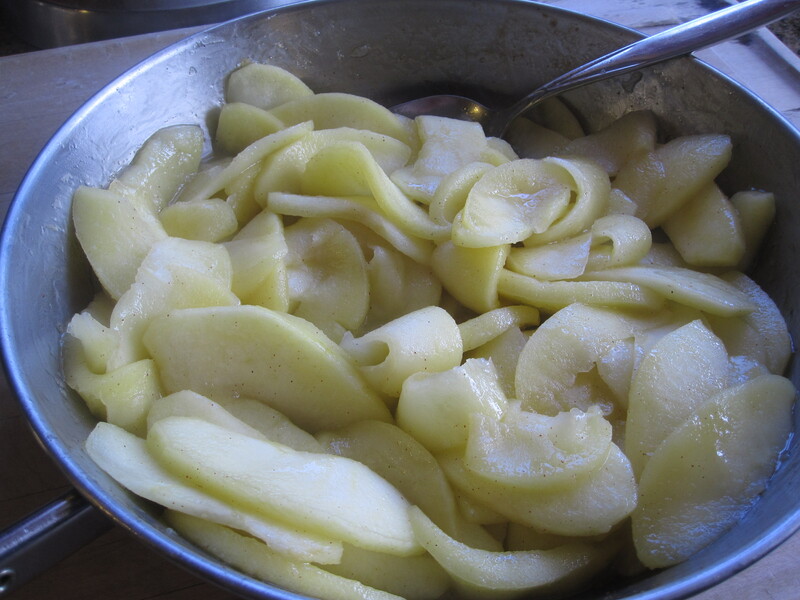 Stir and cook until apple slices become soft enough to roll up (the juice should be almost dried up at this point). Remove from heat and cool completely. 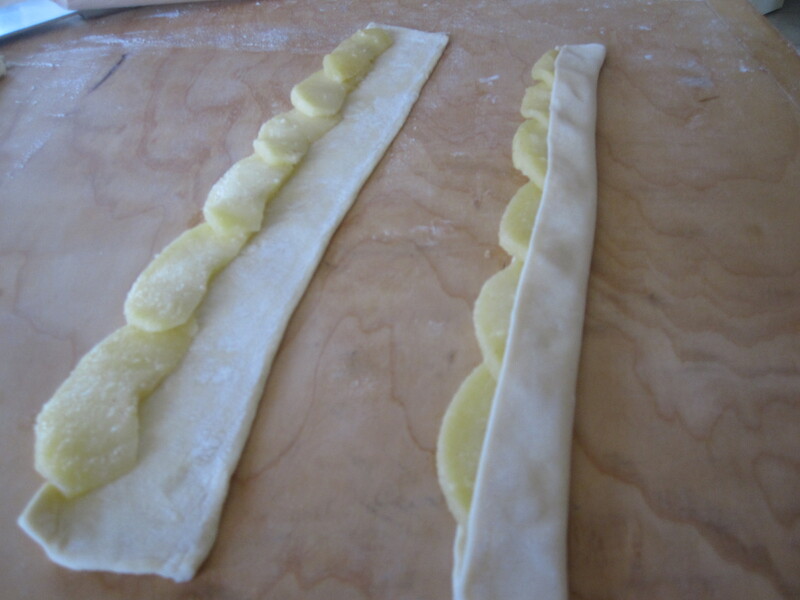 Take a sheet of pastry and cut into 6 strips lengthwise. Roll out each strip to 15 inches long. 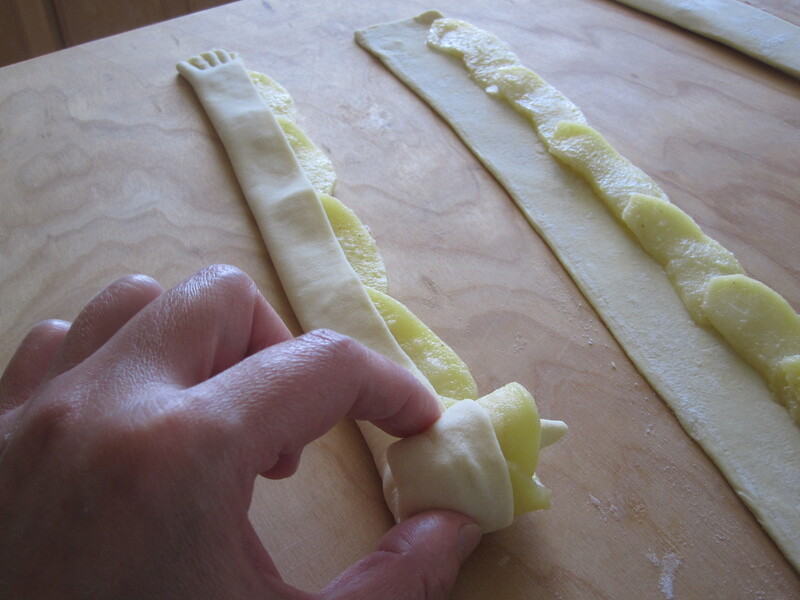 Arrange apple slices on one side of a pastry strip, with part of apple hanging over the strip (it’s okay to overlap apple slices). Leave a 1/2 inch space at both ends. 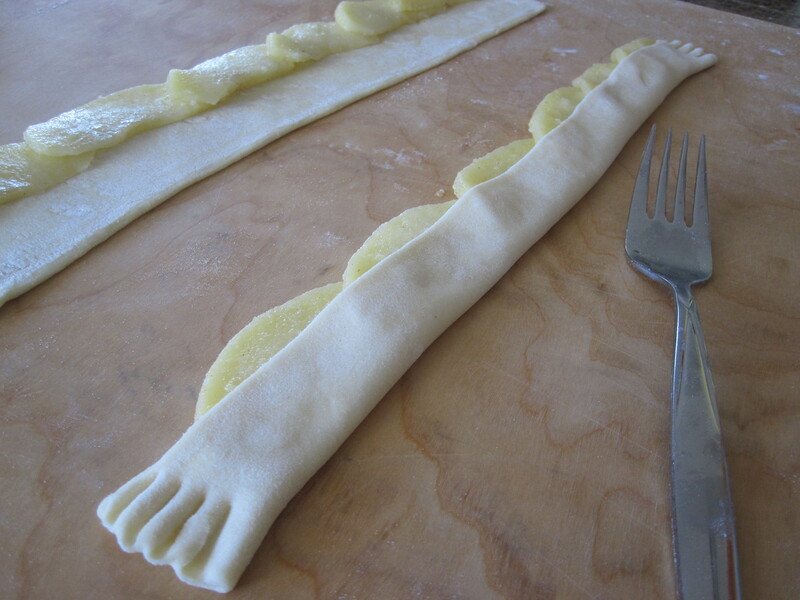 Fold the pastry on the other side over apple slices. Use a fork to press to seal both ends. 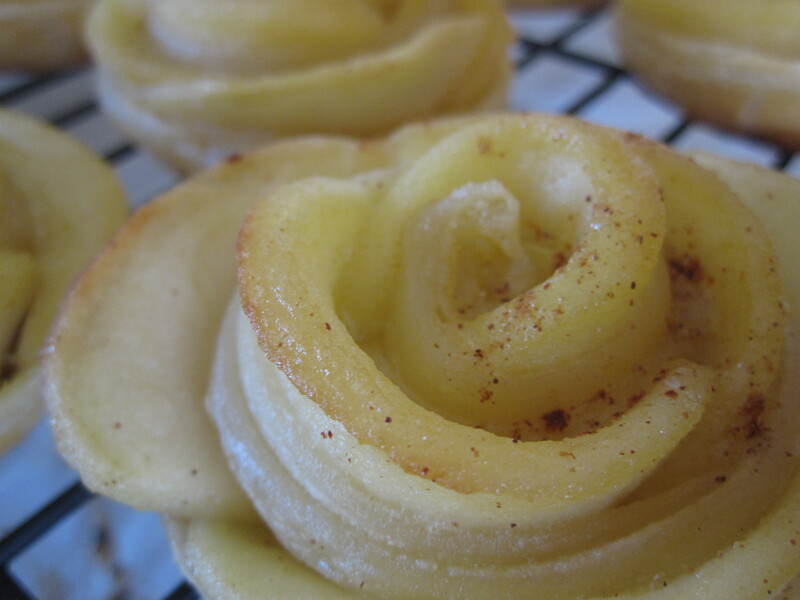 Coil pastry strips up, and tuck the end under the pastry rose. Bake at preheated 400°F oven for 15-18 minutes. As I said, this is not a perfect recipe yet~ My problem is the puff pastry didn’t cooked all way through especially towards the center. The outer layer of pastry was puffy and the bottom was quite brown already but not the center!! I think my temperature maybe too high. If I lower to 375°F then will the pastry puff up? or maybe I coil up too tight? If I loose up a little will the pastry in the center bake up better? I couldn’t bake any further this time as the bottom of the roses were quite brown, and the roses start having a burning edge on their “petals” already… hmm, more trial to come.